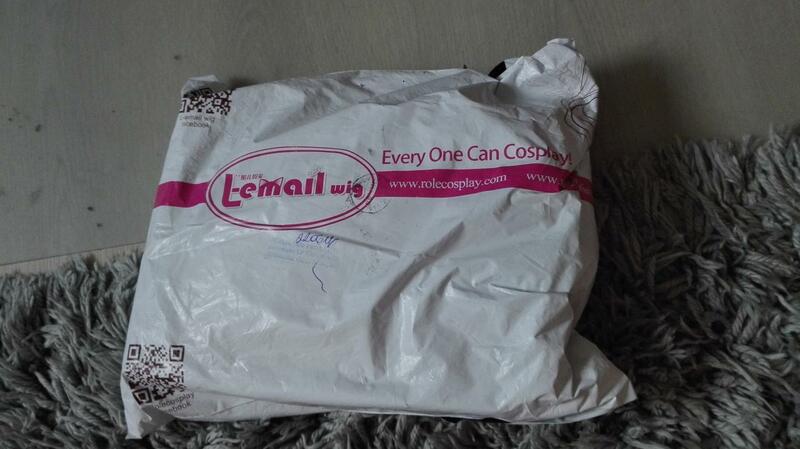 It was packed into this thick, plastic bag, but also protected by kinda strong cardboard. Package not came any bended or something, which is also a big thumbs up from me! 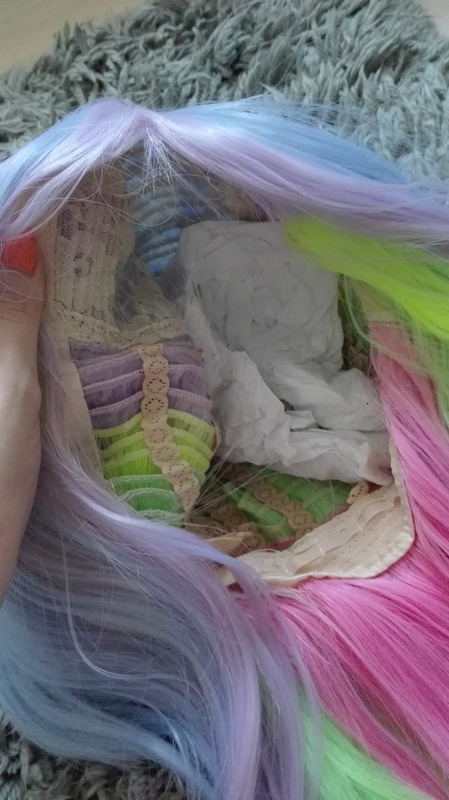 Wig and ponytail were packed separately, so it was well-prevented from tangling! 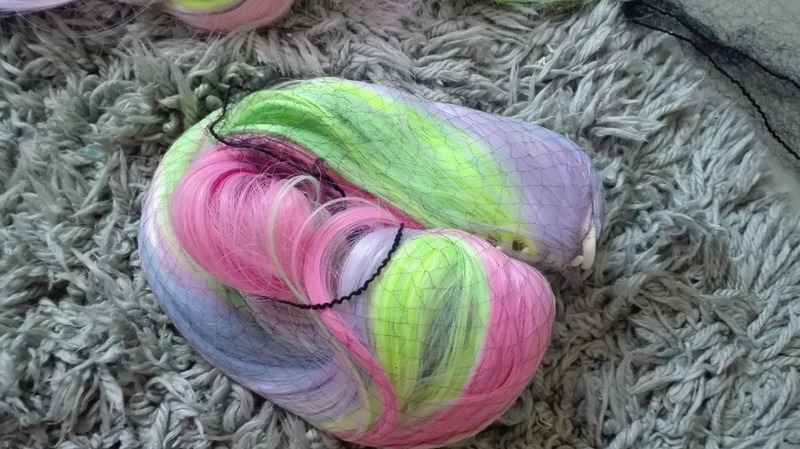 Both were in those fishnet-like things, but that’s absolutely great, since it also helps from damaging wig. From there you can see the variety of colors which this has *^* It’s really nice combination and really accurate to what actual character has. 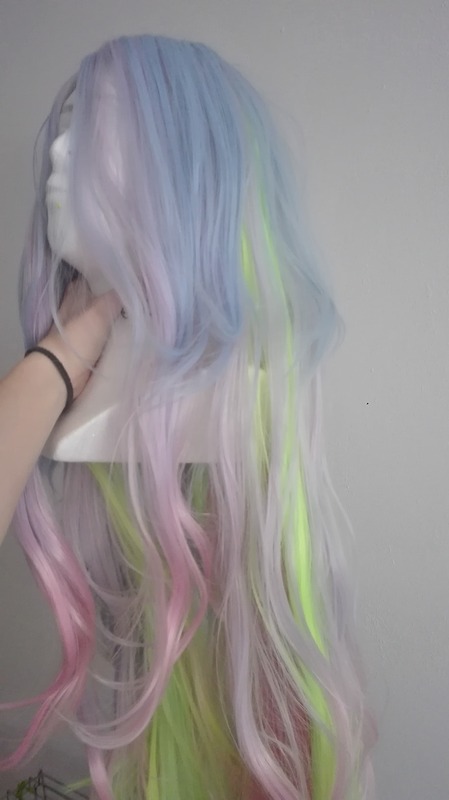 Let’s talk about ponytail! 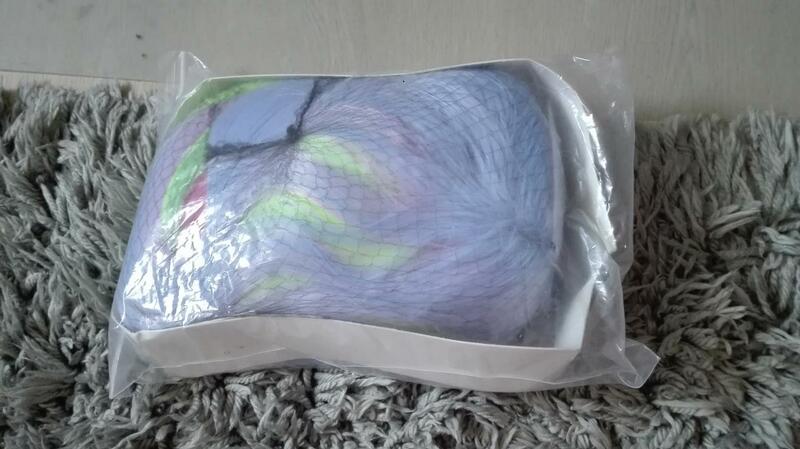 It has really soft hair, super easy to comb. 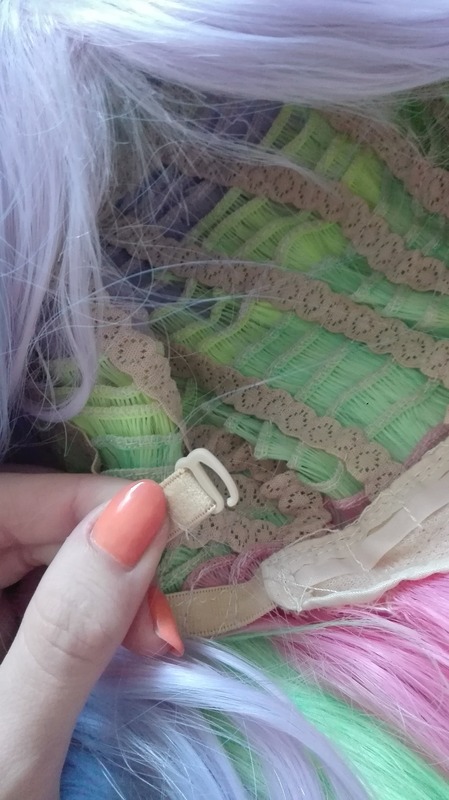 The clip is strong and keeps it in right position. 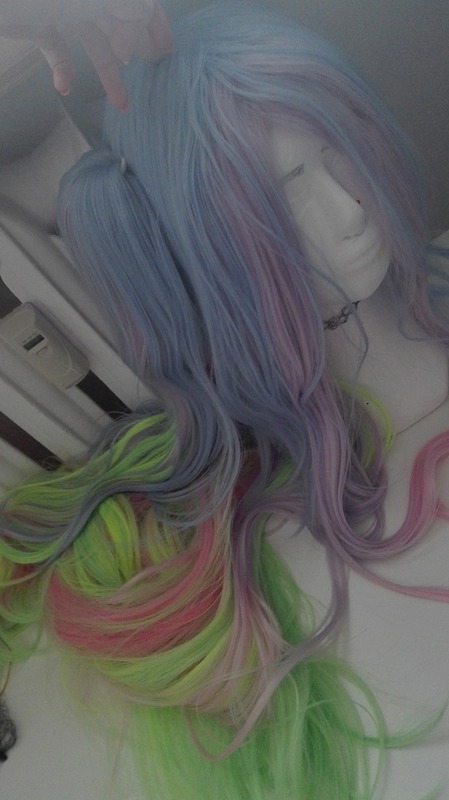 I’m really happy, because it has as much colors as the wig but also you can’t see through, so it gives more ‘natural’ vibes. 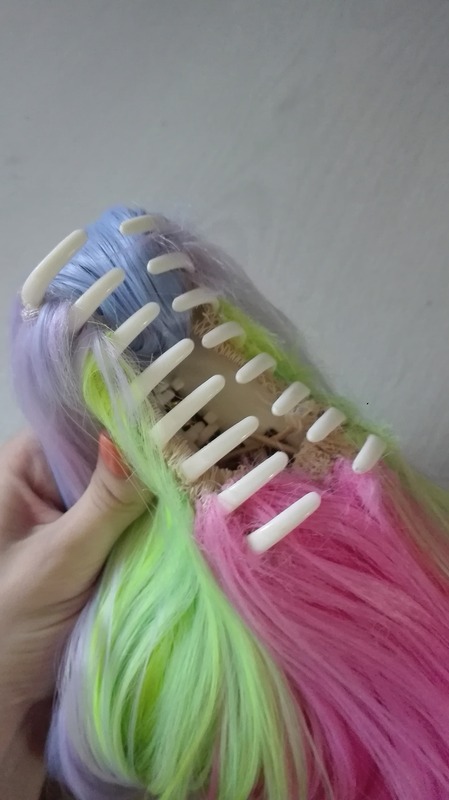 Rubbers aren’t going anywhere as so is the hair. 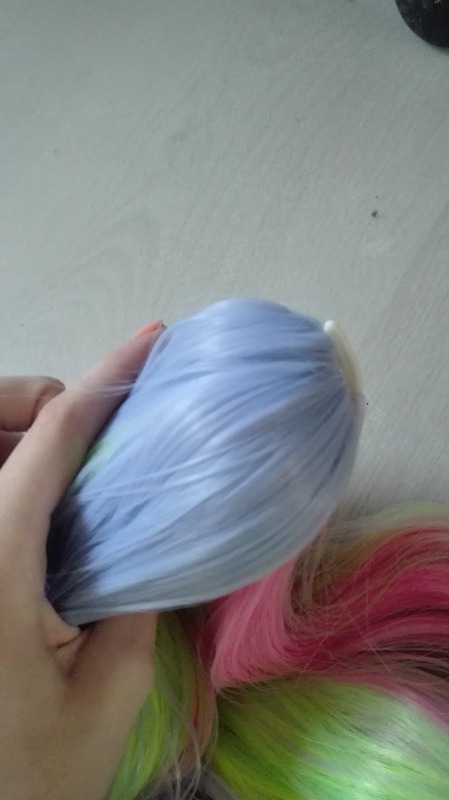 I didn’t notice any fussing hairfall just maybe 2-3 single hairs, but that always happens. On the inside, it has this protecting piece of paper. 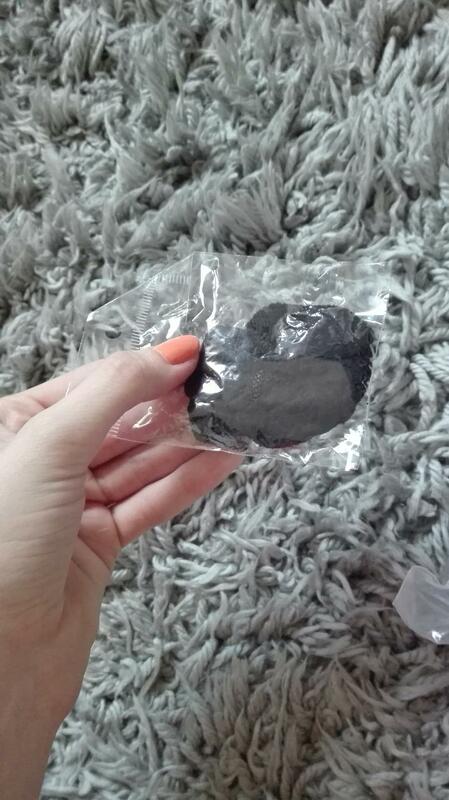 When you throw it away, it shows the cap, which is really well-made, lace one. (I personally hate those partybox ones, so that’s plus!) 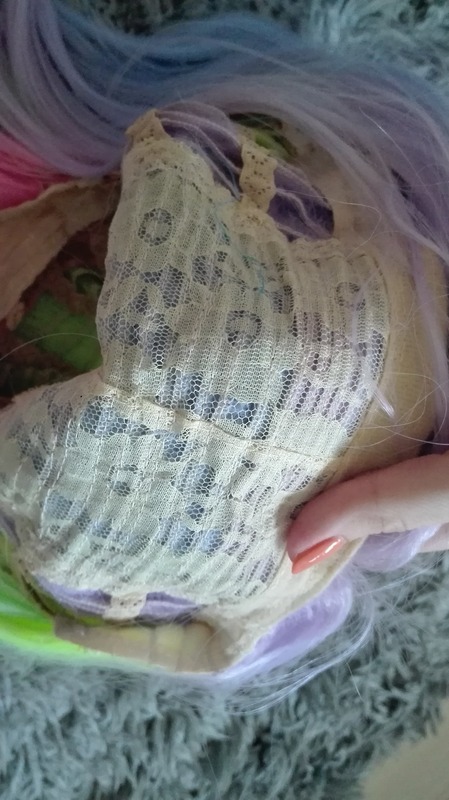 You can adjust size of it with hooks on both sides at the inside. This helps to avert falling from your head. 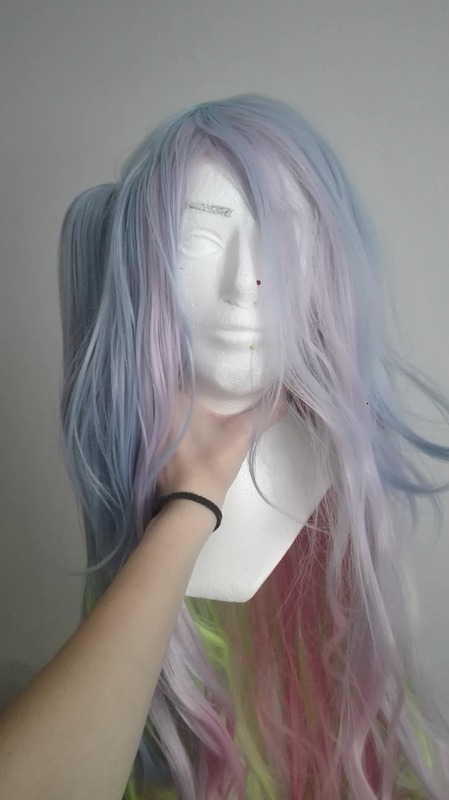 Back to the main part of the wig. 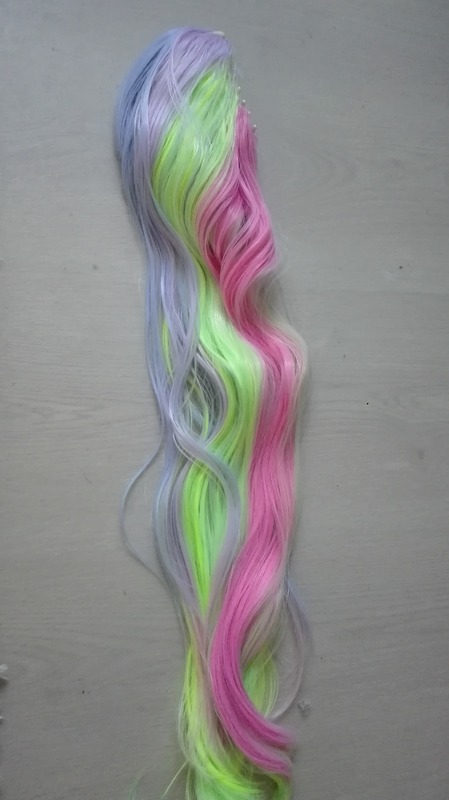 As you can see, it’s quite long, so I’m struggling with making full photo of it, haha. Colors are really good chosen, but I have one issue. In my opinion there should be more of blue-purple tones instead of this yellow-green huge part, but it doesn’t bother that much. Overall look. 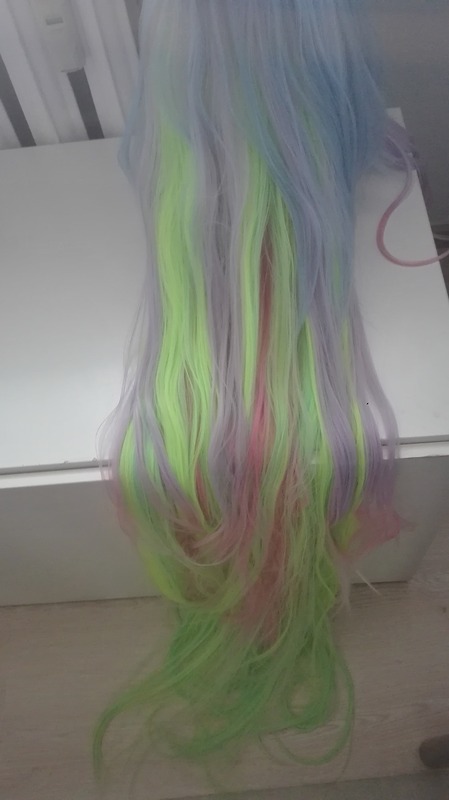 It’s really colorful and long wig (it has 120 cm!) 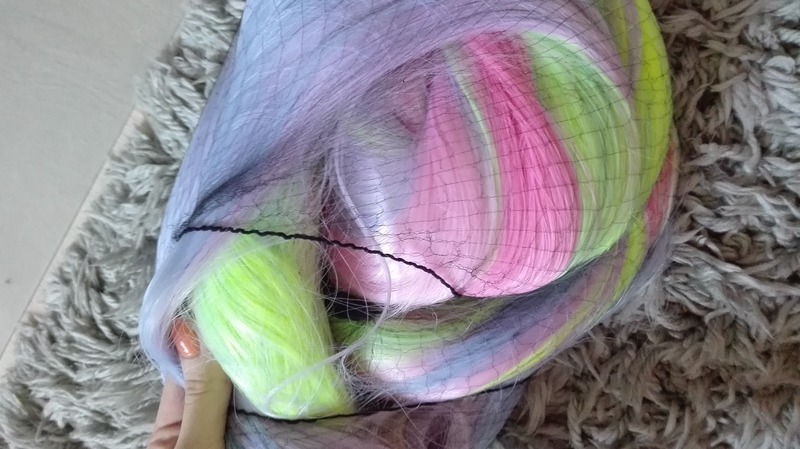 And you can see amount of yellow and green, which I talked about. 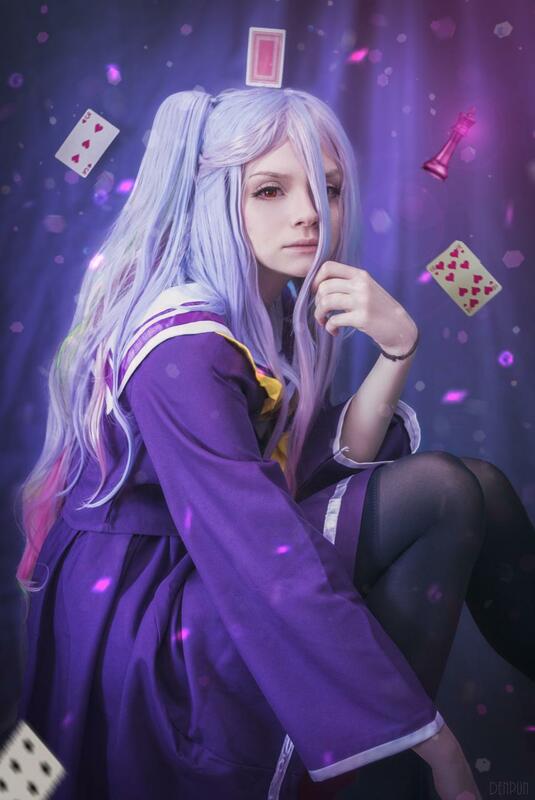 This entry was posted in Buy Cosplay Wigs, L-email Wig review, L-email Wig Sponsorship, Wigs and tagged cosplay wig, lemail wig review, no game no life, shiro wig, wig review.